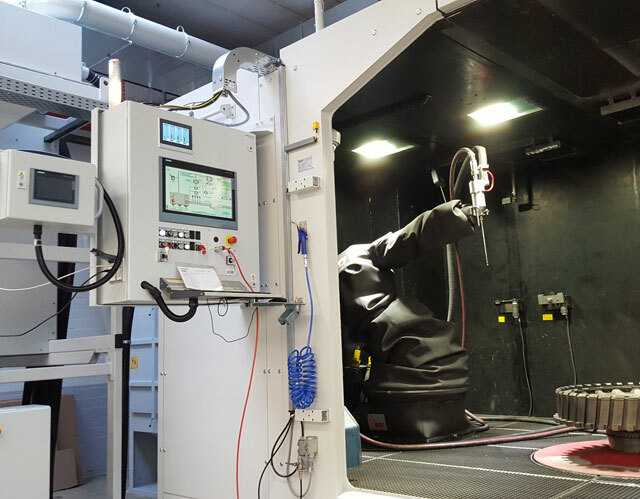 At SR Technics Switzerland Ltd. in Zurich, a new roxor (Freymatic AG) robotic shot peening machine with TBM control was successfully put into operation. SR Technics is one of the leading providers of maintenance (MRO) services for aircrafts and their engines. Freymatic is a leading manufacturer of shot peening systems, known under the roxor brand. The machines are in demand when the highest requirements for critical process parameters have to be met. The machines are mainly used in the aerospace industry for the surface treatment of mechanically and thermally highly stressed parts. SR Technics AG was looking for a high-precision shot peening machine for a continuous peening process with high process reliability. The control system had to be easy to operate. The control concept and the components should enable a later cloud connection. The pressure shot peening system for machining engine parts was to be designed with 4 blasting nozzles for simultaneous machining. Particular emphasis was placed on the control behaviour of the blasting process and on the recording and logging of the process parameters. 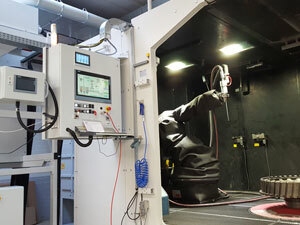 The nozzle movement was to be realized by using a 6-axis robot with an additional rotary table axis. The control concept is based on a SIMATIC S7-1500 CPU and a Simatic IPC 827D with SIMATIC FPI1900 touch panel for the process control system. 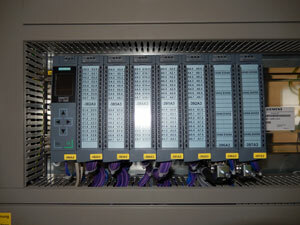 The concept allows a fully integrated software solution of PLC, HMI and robot functionality. 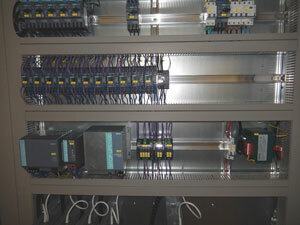 The communication and coordination with the robot was solved via ProfiNet. TBM Automation AG was well placed to contribute its 25 years of experience in control engineering and shot peening technology to the solution. The customer benefits from a high-precision blasting process and high process reliability as well as simple operation. By linking PLC and robot via ProfiNet, it was possible to create an integrated solution that allows all process parameters to be recorded and logged. All important data are available via ProfiNet at the HMI or via OPC UA at any time. Remote maintenance of all devices is also possible and increases the system availability. Relevant process data can be transferred via OPC-UA into the customer's MES (Manufacturing Execution System) or into the cloud.